This past week I had a hankering for something grilled. 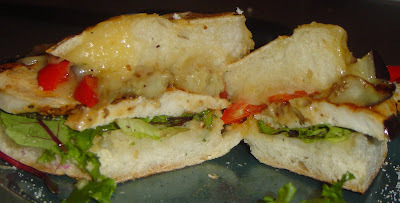 More specifically, I was in the mood for a sandwich that was light, tasty, and full of flavor. I am not ashamed to admit that I actually spent most of the day at work brainstorming intermittently on what would accomplish this. By the time I got home, I had it all planned out...all I had to do was convince BD to be "in the mood" for the same. I decided on making a grilled sandwich. 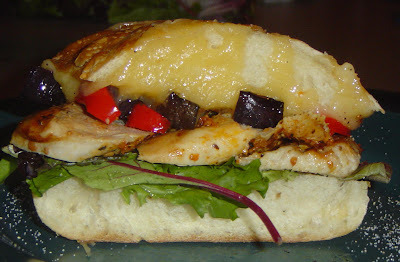 Grilled chicken, grilled eggplant, grilled red bell peppers with mesclun greens and some melty cheese on some good bread. 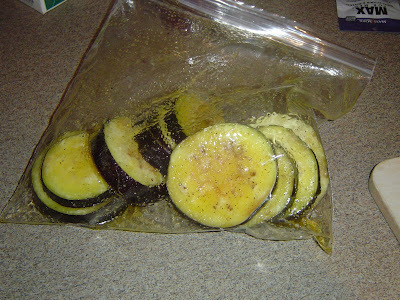 To start, I sliced the eggplant and dropped it into a Ziploc baggy with some EVOO, S&P and garlic and onion powder to marinate for a few minutes. 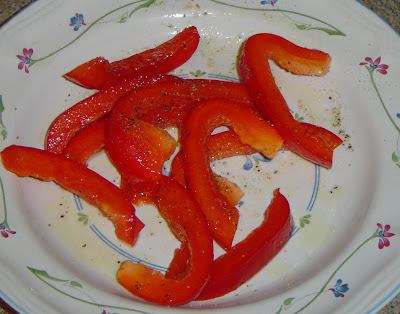 While the eggplant was doing it's thang, I sliced about half a red bell pepper that I had in the fridge. Then I sprinkled on some S&P and EVOO and threw it on the fire. I wanted the to peppers to retain their texture and not get too mushy so I only left them on long enough to soften slightly and get a little charred on the outside. I knew the eggplant would be more on the soft side so I wanted a variety of textures and not just a "mush"wich. For being a professional cook, BD is much more picky than I am. For example, he hates green peppers but will eat the rest. I'll eat them all but will gravitate towards the green for everyday sort of things such as chili or in with a sausage pasta dish. The main reason being they cost about a third of the rest of the other colors of peppers. But for this meal I knew red was the way to go. A little sweeter and not as strong in flavor and it was all about balance for this sandwich. Next I prepped my chicken. 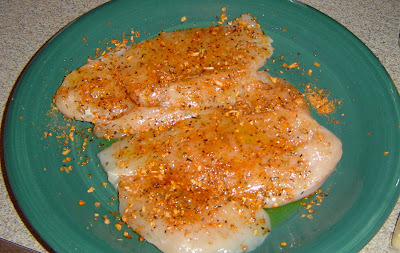 After washing the breasts and patting it dry I rubbed on McCormick's Roasted Garlic Chicken Rub. 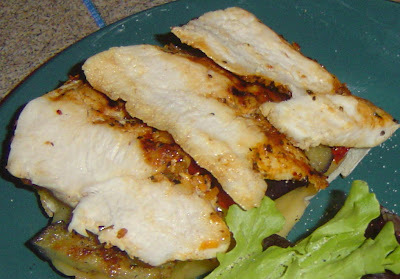 I've always found this one to give a good flavor and add some color to the chicken. 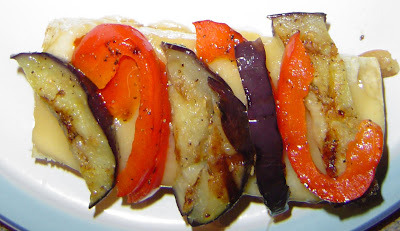 Before placing it on the grill I drizzled it with EVOO to prevent sticking. 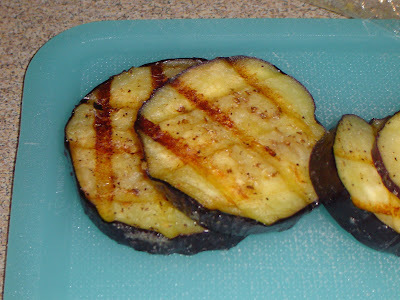 While the chicken was waiting, I grilled my eggplant. Mid way through the grilling process I rotated each slice so I would get some nice grill marks on them. Once they cooled down a little I sliced them into fourths. For my tasty crusty bread I chose to use to go with Ecce Panis Roasted Garlic Italian. 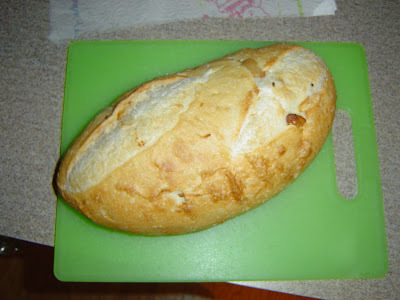 It has whole cloves of roasted garlic studded throughout the bread with a soft, dense inside and a nice outside crust. Love this bread. For the sandwiches we sliced a hunk out of the middle so that we would actually be able to fit the sandwich in our mouths! The bread is VERY thick. Then we spread a little butter on the bottom slice and then topped the other half with sliced Havarti cheese and popped it in the toaster oven to get all melty. Mmmm... melty cheese! 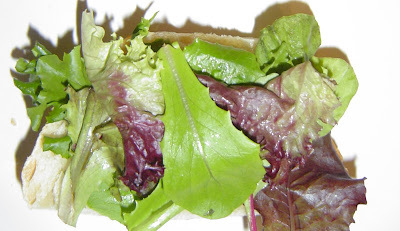 When the cheese and butter had melted we placed the mesclun (mesclun is a mix of baby greens including lettuces, arugula, spinach, radicchio and various others -it depends on the brand) on the buttered side and the roasted red peppers and eggplants on the other. After the chicken was fully cooked we gave it a few minutes to cool and then sliced it on a very thin bias. I think you can see in this picture how thin it was sliced. After that the only thing left was to mush then two halves together, slice it down the middle and eat! You can see that I added a little salt and pepper to my greens first though! My thoughts on this dish: I was really happy with how this little sandwich turned out. All the tastes blended together really well. I toyed with the idea of some kind of saucy topping for this but I couldn't come up with anything that sounded good. After eating it, I didn't think it really needed it between the butter, cheese and the natural moistness of the veggies and chicken. BD said it would have been better with something though. I have a feeling that grilled sandwiches are going to be my new favorite food for the summer. Happy grilling!